The Red Roses Inlay Wood Cremation Urn is a beautiful tribute to your loved one. A spray of red roses adorns the front of the solid wood urn made of natural cherry (shown in photo), maple, or walnut. 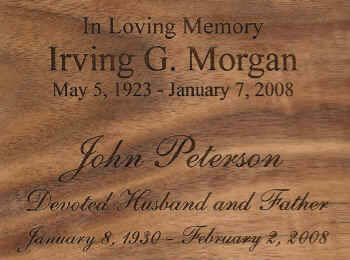 The American craftsmen take pride in their work and deliver a gorgeous memorial for your family member. Cremains are easily loaded through the bottom of the urn by removing the screws and plate. It is important to keep the cremains in a sealed plastic bag inside any urn but especially a bottom-loading urn. Engraving of name, dates, and short sentiment is available for an additional fee. We can engrave a short name and abbreviated dates on the front of the urn, or we can engrave a longer name, dates, and sentiment on the top or back of the urn. There is very limited space on the front of the urn so please take this into account when deciding on the engraving. An engraving proof will NOT be sent so please be sure the spelling and punctuation are correct on your order. Urn usually ships 2 - 4 business days after order is placed, even for expedited orders. Ships from the West Coast.